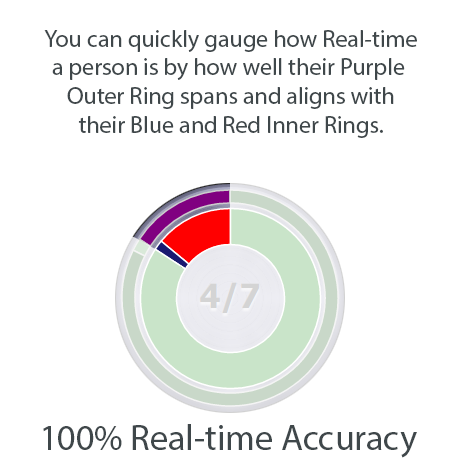 The Time Machine provides real-time data on what your team is currently working on, what your team has produced so far today, and what your team was doing at any previous point in time. The Time Machine achieves this through side-by-side module windows, one for Efficiency Chips and the other for a real-time availability board. Efficiency Chips are a valuable graphical snapshot of both how much each team member has accomplished within a day and how accurately he/she has been updating their work in the company PSA. 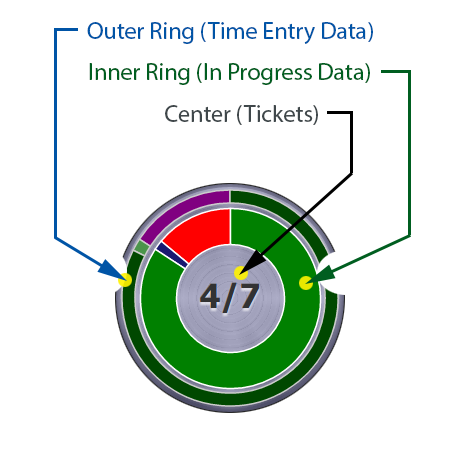 Each chip is broken down into three areas of information: The Outer Ring (for Time Entry Stats), The Inner Ring (for In Progress Stats) and The Center (for Ticket Stats). The more green a chip has, the more efficient an employee has been with their time and their use of the PSA. The more the outer ring and inner ring are in alignment of each other, the more real-time the employee has been updating the PSA. The higher the numbers in the center, the more productive the employee has been at working on tickets. The closer in value the inner two numbers are to each other, the more effective the employee is at resolving tickets he/she works on. You can also click on an efficiency chip to view a more detailed breakdown of this data. 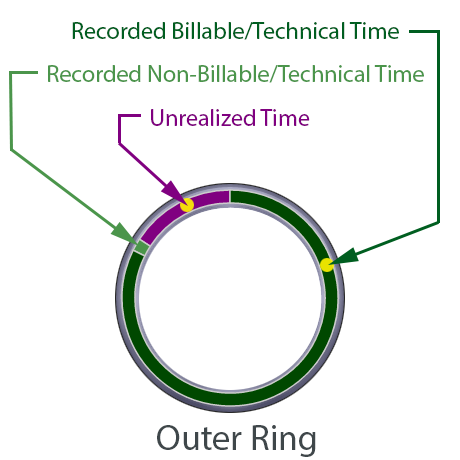 The Outer Ring displays three time entry statistics: Recorded Billable/Technical Time (Dark Green), Recorded Non-Billabe/Non-Technical Time (Light Green), and Unrealized Time (Purple). Billable/Technical time always starts at the top of the ring (Noon/Midnight) and proceeds clockwise. The more technical the position an employee holds, the more Billable/Technical time you would wish to see (versus Non-Billable/Non-Technical Time). 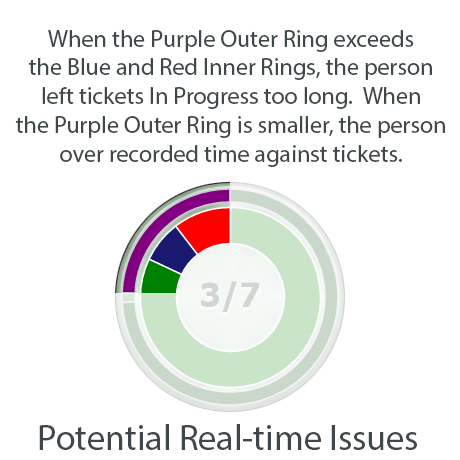 While a ticket is "In Progress" The Time Machine will assume the member is going to create a time entry for he/her work and will assume a Billable/Technical minute for each minute the ticket is held in "In Progress". Once the ticket is taken out of "In Progress", this assumed time is removed as The Time Machine expects a recorded time entry to now exist. Non-Billable/Non-Technical time is always displayed after any Billable/Technical time. The more administrative/managerial the position an employee holds, the more Non-Billable/Non-Technical time you would expect to see (versus Billable/Technical Time). Unrealized time is the difference between how much time could have been recorded since the start of the work day versus how much was actually recorded. For example, if a member's day begins at 9:00 AM and at 9:16AM the member still has not recorded time or placed a ticket In Progress, the member will have a solid purple outer ring. If, at 9:32AM, the member records time from 9:16AM to 9:32AM, the outer ring will be green for the first 180° and purple for the remaining 180°. The Time Machine assumes you will record 15 minutes of work for every 16 minutes of the work day. For Example, for a 9:00AM start work day, The Time Machine is expecting at least 60 minutes of time entries recorded by 10:04AM. 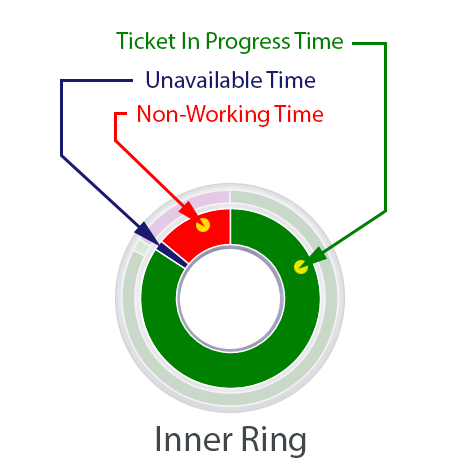 The Inner Ring displays three In Progress statistics: Ticket In Progress Time (Green), Unavailable Time (Dark Blue), and Non-Working Time (Red). In Progress time always starts at the top of the ring (Noon/Midnight) and proceeds clockwise. Whether a member is technical or administrative/managerial, you want has much of their work day against tickets in your PSA as possible. The Time Machine will only accrue In Progress for one ticket at a time. For example, if you hold two tickets simultaneously In Progress for 30 minutes, The Time Machine will only credit you for 30 minutes of In Progress time, not 60 minutes. In Progress Time is accrued whether the ticket is In Progress during working hours or not. The Time Machine provides options for accounting for an individual's time outside your PSA for events such as Away From Keyboard (AKF), Lunch, PTO, Off or Conference. The Time Machine prefers individuals mark themselves or others as one of these unavailable statuses rather than leaving the individual's status published as Unknown or Missing In Action. Unavailable Time is restricted to within the individual's work day only. For example, if a user is flagged as PTO from 6AM - Midnight and the individual's work day is defined as 9AM - 5PM, then only eight hours of "PTO" will be recorded in the Time Machine. Non-Working time is the difference between how much time could have been recorded against In Progress states or Unavailable time since the start of the work day versus how much was actually recorded. For example, if a member's day begins at 9:00 AM and at 9:16AM the member still has not placed a ticket In Progress, the member will have a solid red inner ring. If, between 9:16AM and 9:32AM, the member holds a ticket In Progress, the inner ring will be green for the first 180° and red for the remaining 180°. The Time Machine assumes you will have 15 minutes of In Progress time or Unavailable time for every 16 minutes of the work day. Non-Working Time differs from Unrealized Time in that Non-Working time is restricted to the hours of the work day (office hours). For example, a 9AM - 5PM member recording time entries and In Progress time 6AM - 9AM and 5PM - 10PM will have no unrealized time for their outer ring but will have 7.5 hours of Non-Working time displayed on their inner ring. 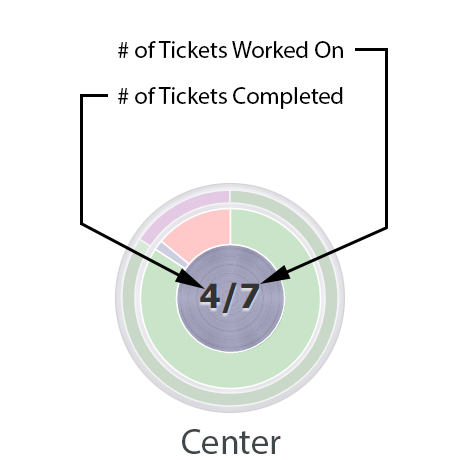 The Center displays two ticket statistics: # of Tickets Completed and # of Tickets Worked On. The first number displayed in the center of the chip is the number of tickets a member has worked on today that have been moved to resolved. "Worked on today" is defined as having a time entry for today against the ticket. A help desk employee should generally be in the teens while a project engineer may have a lower number. The second number displayed in the center of the chip is the number of tickets a member has worked on today. "Worked on today" is defined as having a time entry for today against the ticket. In general, you want the number of tickets worked on to be close to the number of tickets completed. Having a high number of tickets worked on and a low number of tickets completed could indicate the employee is not being very successful at resolving the tickets he/she has worked on.